The New Beatles Bar nestling just behind the Spice of India Tandoori Restaurant on Calle Ibiza was taken over by Tony and Karen from South Wales around 3 months ago and immediately they set about transforming the inside into what is now a very attractive venue for both performers and customers alike. The couple moved over to Spain in March 2008 with the prospect of buying a bar and after a great deal of speculation decided to opt for a Showbar. Tony and Karen are no strangers to small businesses as back in the UK they owned a fruit and veg shop and also at one time had a DIY store. The New Beatles Bar hosts two shows nightly with one act always having the emphasis on comedy. 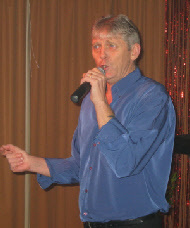 The evenings begin at 20.30 with resident compere Colin Kyle starting off the proceedings before introducing the first act at 21.30. The second show follows almost immediately at 22.30 and Tony has recruited many of Benidorm’s established entertainers including Mickey Lewis, Kenny B, Beverley Fox, Eric Lovaine, Craig Lindsey and Sandy B to name but a few. There is a nice atmosphere in the bar and everyone seemed very friendly and welcoming. I enjoyed my time there and would recommend a visit when you’re next in the vicinity as you will certainly receive a warm welcome from Tony and Karen. This week Nigel takes a trip up Calle Murcia or as it is affectionately know, the Yellow Brick Road. Towards the top of the road is a Bar which has new owners and has just undergone a huge facelift over the past few months. On my weekly wander around the Benidorm Bars I found myself in a relatively new bar just off the British Square situated on Calle Lepanto by the name of Scotties. The Bar opened in July 2008 and since then has been popular with holiday makers and locals alike and as the name suggests takes on a Scottish theme. The owners Billy and Stuart both hail from Scotland where Billy was in the law business in Edinburgh and Stuart was an entertainer who played the ‘Circuit’ for many years on accordion and worked with many big names including Bob Monkhouse, Tom O’Connor and Mike Reid to name but a few in addition to being a one time Butlins Red Coat. My first impression of the Bar was that it was very friendly and welcoming and there was also an air of fun around the place. I joined in with the music and general knowledge quizzes which were free to enter and then witnessed a game of play your cards right which was very entertaining to watch. It was clear to see that a lot of work has gone into making this venue a great place to be. The Bar is very clean and tastefully decorated and can hold up to 80 people. They have Sky Sports showing all the major events and there is even a pool table to add to your entertainment. 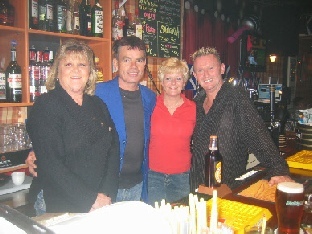 Next time you are in Benidorm pop in to Scotties and say hello to the gang down there you’re sure to receive a warm welcome.